The leading monthly fashion, entertainment and lifestyle magazine featured MARIA.B.’s Astitva collection launch in its news section. Pictorial content included an image of the designer and an image of the catalogue of the collection. This entry was posted in Maria B on June 22, 2014 by admin. 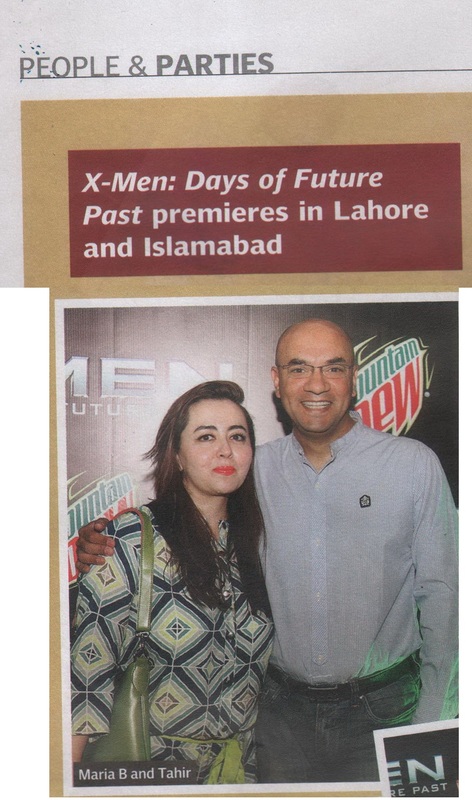 The Sunday magazine of the leading English language broadsheet featured an image of designer Maria B. at the premiere event of a movie. This entry was posted in Maria B on June 12, 2014 by admin. 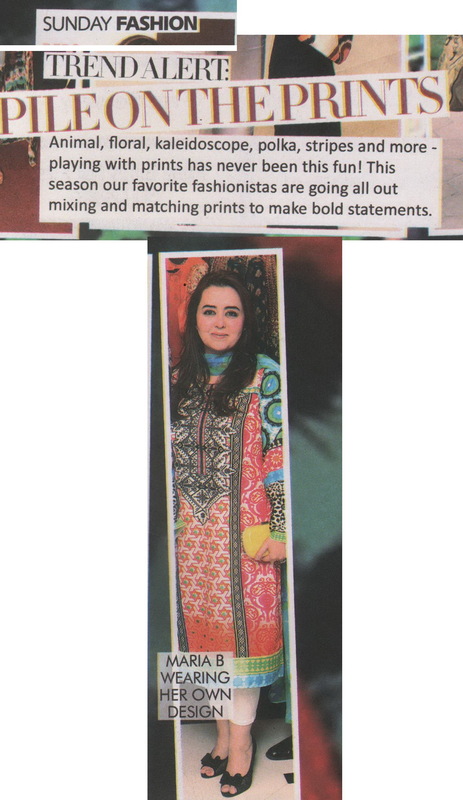 The monthly fashion, entertainment and lifestyle magazine featured Maria B. in its Celebrity Sojourn section. Pictorial content included a profile image of designer Maria B. and a picture of Maria with her daughter. This entry was posted in Maria B on June 8, 2014 by admin. The Sunday magazine of the leading English language broadsheet featured a tweet by designer Maria B. in their Photo-booth section. This entry was posted in Maria B, Lawn 2014 on June 8, 2014 by admin. The Sunday magazine of the leading English language broadsheet featured an official image from the official photo-shoot of MARIA.B. 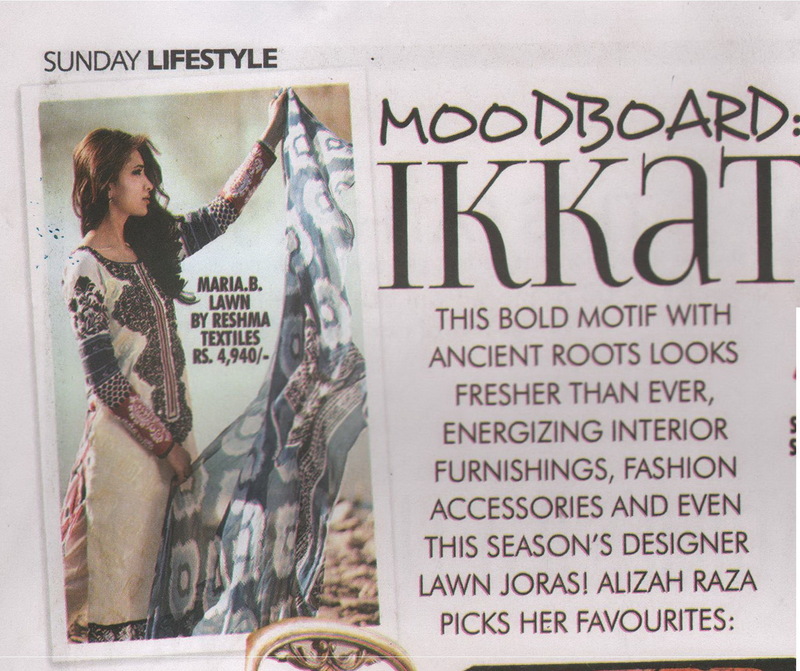 Lawn by Reshma Tex in a mood-board piece which focused on Ikkat. This entry was posted in Maria B, Lawn 2014 on June 7, 2014 by admin. 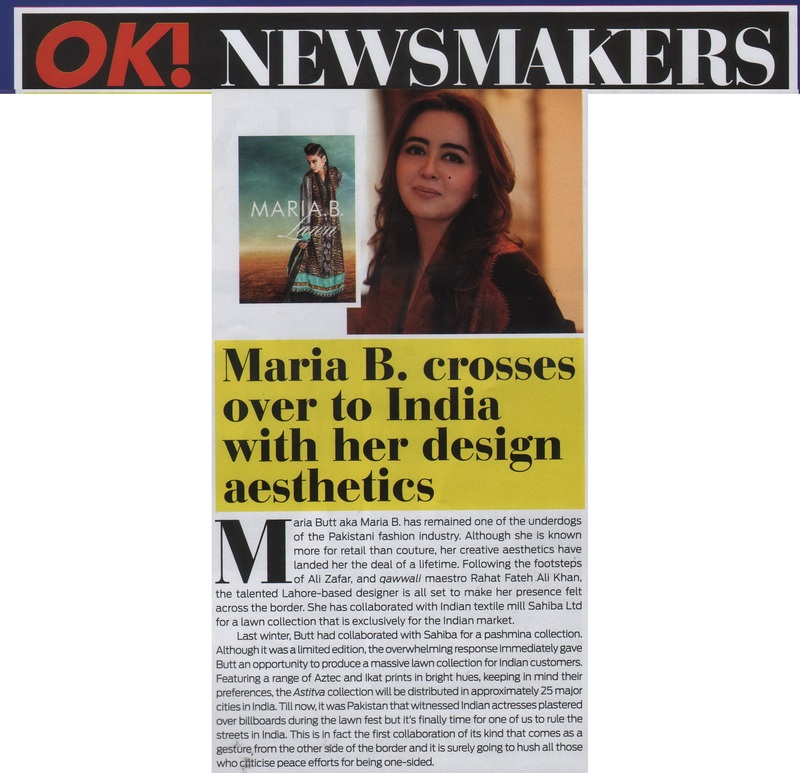 The leading weekly fashion, entertainment and lifestyle magazine featured an editorial photo-shoot in which MARIA.B.’s Ladakh Connection collection was featured. An image of a model wearing MARIA.B. was also featured on the cover of the publication. This entry was posted in Maria B, Lawn 2014 on June 1, 2014 by admin. The Pakistani media, current affairs and culture web portal published the official press release announcing MARIA.B.’s Astitva collection. The write-up included detailed collection information, an image from the photo-shoot of the new collection and was accompanied by a quote by designer Maria B. This entry was posted in Maria B on June 1, 2014 by admin. Designer Maria B. was featured in a piece about inculcating the habit of cooking in girls from a young age. The feature was accompanied by an image of the designer with her daughter.